Turning the tables on the venerable “Christmas in July” tradition, Southern Lights (running December 7 through December 22) slips in a bluesy, Texas-in-July tale of true love gone bad, success, and betrayal in this all-new revival from playwright Lee Brady set in a down-home bar and told through the lens of country music, complete with the torch-n-twang, real pathos and sentimentality the genre is known and loved for. 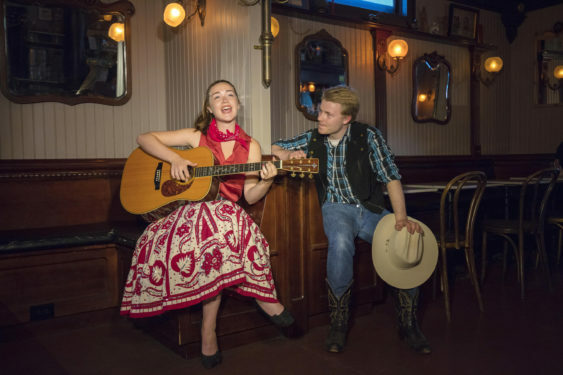 Directed by Andrea Gordon with musical direction by Robert Beifus, the play tells the story of Callie Calendar and Lonn McGee, the daughter and adopted son respectively of country music legend, Cash Callendar, when Callie and Lonn’s passionate teenage love affair was shattered by a very public tragedy. Sorry! The contest for Southern Lights: A Country Music Romance | Z Below Theater has ended.